The last month has seen a wide range of new additions to VioVet, including two exciting new brands and additions to already popular ranges. Alfalfa King and Brinicombe Equine are now available and bring with them some fantastic products which you can look at below. Supa adds a selection of wild bird feeders to its range, and Hikari have had their range completed so now you can get all the high quality food you need for your pet fish. This month we have expanded our selection of Hikari Fish Foods with the Saki-Hikari range. Hikari have been producing quality fish food for many years from their base in Japan. Not only do they produce their sought after food there, they own the Yamasaki Koi Farm which is one of the largest in Japan. You can be sure that all their food has been produced with quality in mind, and tested by vast arrays of their own fish, before being made available for all kinds of pet fish, whether big or small. The Saki Hikari Fish Food is tailored to Nishikigoi professionals as well as Koi enthusiasts. Each type of food in the range has been developed into a specific diet which maintains the health, colour, condition and form of Koi fish. They also all contain a strain of natural bacteria, named Hikari-Germ, to provide good bacteria which improves the feeder's digestive capacity. This bacteria also helps to fight against disease and illness, giving you peace of mind that you are keeping your fish healthy as well as fed. Another company which has become available from VioVet over the last month is Brinicombe Equine. Based in Devon, they aim to provide the highest quality supplements available for your horse by using the most technically advanced ingredients available. They provide support for the whole range of horse needs, calming products to hoof care and joint care all the way through to their very own salt lick range. 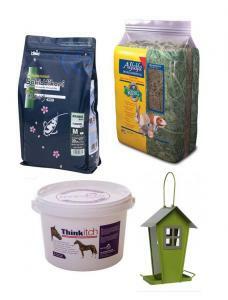 It is also pleasing to know that all the products have been approved to HRA/FEI competition rules. It can be easy to just think of a garden bird feeder as just there to provide its function of keeping your garden birds well fed. That doesn't need to be the case, as Supa have shown with their new range of contemporary wild bird feeders. Supa started life just after the second world war, emerging from a hobby which expanded to a fish food producing business started by Reg Hutchinson who came out of the British Army. Supa are no strangers to bird feeders, however, as they have had a range of bird products available, but never have they released a range which is so pleasing to the eye.